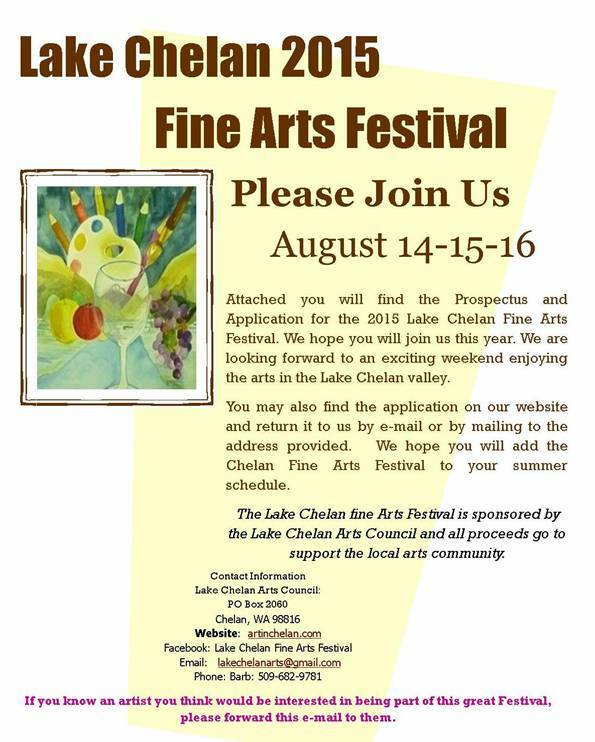 The Lake Chelan 2015 Fine Arts Festival takes place August 14-15-16. If you are an artist and are considering hosting a booth, now is the time to apply! Applications are due April 20th. The Festival is held in the heart of the Summer when Lake Chelan is at its best and visitors are enjoying not only the lake and great local wineries but also the Lake Chelan Valley business communities of Chelan and Manson. The Riverwalk Park Fine Arts and Fine Crafts Venue, located in downtown Chelan in Riverwalk Park, will provide an area where juried artists can display and sell their original works of art. The Festival includes Fine Arts, traditional arts and crafts, culinary arts, live entertainment, food and a kid’s castle and art center. Click here to download an application: 2015 BOOTH APPLICATION & PROSPECTUS.